The buckskinning hobby in Scandinavia is to a large extent centered around a variety of gatherings, a phenomena known as “rendezvous”. If you are interested in North American fur trade or frontier history and want to “live it out”, rendezvous is a great place to start. As an example; High Chaparral (the wild west theme park) probably has the longest record of organizing rendezvous in Scandinavia, and is a great place to visit as a tourist. If you feel the urge to take it further, you'll need to take the first step from being a mere tourist to participant. Once a participant you will notice there are a number of different ways to approach the buckskinning hobby. If you feel authenticity is important both in gear and experience, the following lines will hopefully be helpful. If you are enjoying yourself just the way it is. Keep on doing what you are doing! Fun is the key element no matter how you do this. - Living history, experimental archeology, re-enactment etc. Start by reading some of our thoughts on the philosophy and terminology behind our way of enjoying the past. Living history, experimental archeology, re-enactment etc. These are terms you will soon encounter as you start searching for information (read Google). Let’s just say that they all have things in common but still differ enough to keep separated. What S.M.M. does, is probably best described as a combination of the first two, living history and experimental archeology. 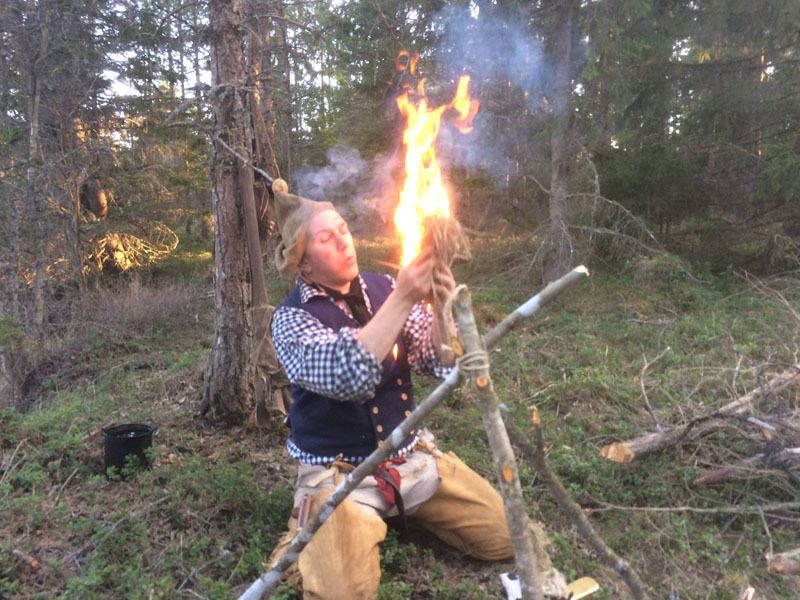 We aim to live history rather than act it (living history) and we confirm or condemn theoretic solutions by practicing them out in the wild (experimental archeology). We even use terms like re-living and re-creating the past. Re-enactment is a closely related term, but better suited for battlefields and orchestrated specific historical events than what the S.M.M. does. Whatever you choose to call it, there is more to this hobby than just posing with your gear in front of the camera. To read and study yourself towards historic knowledge, and practice the lifestyle an 18th or 19th century frontiers person out in the wild, helps your personal understanding of history, and makes your portrayal more realistic without “acting a role”. To take the next large step, from participant to re-living the past it helps to decide what historic period and what kind of persona you find most appealing. Floating across different eras is a possibility, but takes a lot of time, knowledge and equipment to carry out without mixing it up to an unrecognizable mishmash. By picking a persona and in order to experience history as yourself, you set your personal time machine by pin pointing a position on the time line, on the map and on the social scale. And in order to not get confused with something from another planet on arrival, you do your homework to gear up, skill up and learn the details of history to comfortably throw yourself down by the nearest camp fire and present yourself with your own name. In other words; ”What did I do? When and where was I active? What social status did I have?” are questions that needs an answer to make the right choices along your path towards authenticity. Google, read through web forums and join facebook groups for a first hint of information, and don’t be afraid to ask for a source. Read secondary source books (like the Book of Buckskinning series) and read old journals for a first hand source of information. Look at sketches and paintings from artists that actually were there. Research to find the answer before using your own, Hollywood’s or your rendezvous neighbor’s idea … AND research to find out what was common rather than what you wish was common. The world wide web is a great place to start any research project, but books and tons of books are still needed to dive deep. Sadly, books on these subjects can be hard to find in Scandinavia. Unless you want to create a library of your own (easily happens), online books and borrowing from a friend are cheap options. Borrowing from Scandinavian library’s also works, but the selection is often rather slim on this subject. Antique book stores and buying from abroad is usually the easiest way to get the book you want in the end. And then you can underline and make notes all you want. We all have an inner image of what history looked like and what life back then was like. Be prepared to continuously revise that image as you learn more and new information becomes available. Copying other people’s stuff and motivate it with “He’s an authentic dude!” is re-creating a fellow living historian, not recreating the past. Rather ask, and ask for the source to back it up. When something is original, constructed just like an original or has the appearance of being original the term authentic is often applied. When it comes to living history it has the exact same meaning; that the item or preferably both appearance and skills used are true to the historic original that you try to re-create. We don’t know if it is possible to reach complete authenticity hundreds of years after the actual period of time. All we know is the strive towards it is part of the fun. Another terms often thrown around in the authenticity discussion is “period correct” or PC i.e. that something is right for the time period. To summon it up; research combined with experience on the ground is the best way to achieve authenticity in both gear and skill. The world has changed since our role-models walked around in moccasins. Recreating the old days nowadays usually demands a certain amount of adapting, or compromise if you so please. The trick is keeping it down to a bare minimum! As you leave modern society for some well-deserved historic time on the ground, most of us need to bring a few objects that just have no good place in a historic camp other than hidden away. Your modern life might demand a certain degree of compromise to be able to partake. Car keys, medications, means to communicate with the outside world and cameras are a few of the common examples. Water purifying filters, modern maps, needed permits are others due to a world no longer as clean or free. A good rule of thought is that all activities performed in the old days that are not regulated by modern law can be done the same way today. It might be inconvenient, it might be expensive, it might be wetter, cooler and taste worse than modern options. But that’s a part of experiencing the past if that is what you want to do. If you argue that “You brought your camera, so my synthetic sleeping bag, candy bars and beer cans should be just as welcome”, a minimum of compromise probably isn’t your thing. Avoid if possible, keep it down to a necessary minimum if needed, keep it hidden when not in use, and try to be discreet when using it. That way living history and the modern world can work together with a minimum of compromise. "The kit I selected from my baggage was merely half a dozen coloured shirts, an over-coat of white blanket with a hood, a leather belt, a broad brimmed un-napped white hat, my ammunition, and a rifle; a tooth-brush, and a mane-comb which I thought least likely to break, were in my pocket, a butcher-knife was in my belt, and an awl was attached to my pouch, which, with a transparent horn of powder, and a wooden measure hanging to it, completed my equipment.."
No matter how you approach buckskinning, “stuff” will be a huge part of it. For your first kit that can be used outside the comforts of rendezvous the following guidelines will hopefully help you pick and choose. In most cases we don’t tell you what to make or buy, rather what you should keep in mind. These were made with a Euroamerican persona in mind. Clothing varied a great deal as the fur trade swept across North America. Therefore specific garments are not discussed. Rather buy or make the common before the uncommon. Mainstream (as in back then) might be boring, but helps your persona become more believable. Keep in mind that mainstream and what was common back then probably isn’t what you find most eye catching at a modern rendezvous. As you start working on your period wardrobe, machine stitched cloth clothing will likely be hard to avoid for your first set. All clothing from the pre-1840 period was hand stitched and should be prioritized as you advance. A machine stitched garment made after a correct pattern is a better starting point than a poorly hand stitched make belief garment. So improve your hand stitching skills and re-search to find a good pattern that includes hand stitching instructions while you wear out that first machine stitched shirt. Smaller items, such as bags, is a great place to start your hand stitching career. But no matter how small an item… never, NEVER use artificial sinew or other synthetic thread. Whatever you make with it is out of time! Use waxed linen thread, genuine sinew or whatever natural fiber thread being commonly available to your persona instead. Patterns has been mentioned but important enough to repeat. Use good historic patterns, preferably with hand stitching instructions included. Don’t make a set of buckskin Levi’s and think they’re authentic just because they’re made of hide, it doesn’t even help to use braintan. Correct cut and fit is essential when re-creating historic garments. So buy a pattern or make your own after an original garment if you are skilled enough. Always keep functionality at mind, trial and error might be your best guide to achieve it. Just keep in mind that history fits a bit different in all aspects and might take some time to get used to. That’s part of the experience! Use fabrics and materials known to the originals such as wool, linen, cotton, smoke tanned hides etc. Synthetics are out of the question. Fabrics and readymade clothing was a staple throughout the fur trade. Cloth clothing made after a good historic pattern is also a great place to start moneywise, and always more authentic than those brain tanned Levi´s. 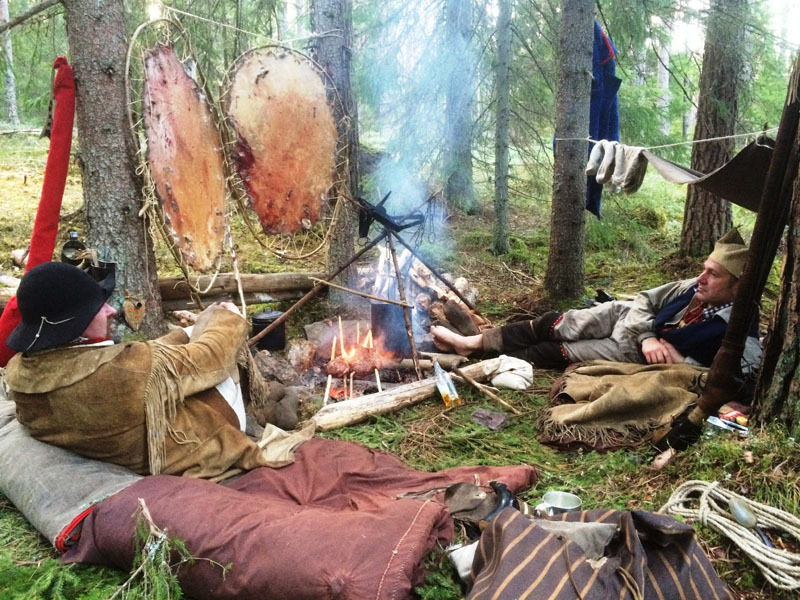 Garments made from hide was used to a variating degree on the frontier. So called braintan or smoketan was the tanning method used by the Native Americans who supplied it to Euromericans to a large extent. Finnished smoked braintan is hard to find in Europe today. The process is labor intensive and hides are therefore expensive to buy once found. Learning how to “brain” yourself is one of those skills that should be learned on the trail towards authenticity. If braintan is out of the question for your first projects the second best option is the fish oil tan or German tan that was used to some extent in the colonies and is sometimes hard to separate from braintan, especially when smoked for a braintan touch. Before shopping, ask around to get a chance to actually feel and smell the real deal so you know what you are looking for. Stay away from those cut antler buttons. Use historic styled pewter, lead, brass, glass, shell, bone etc. instead. Go easy on the decorations, it’s easy to fall down the foo-feer-aw stairway to Hollywood. Decorations can be extremely authentic, but it can also turn a once great piece of garment into a spacesuit. Re-search well before you dive into quills and bead, it’s addictive. Basic camp gear varied far less that clothing over the years. Details changed though which is up to you to research further. Talk to your trail partners if there are any. Acting like a group and sharing gear saves both weight, money and adds authenticity as most excursions back in the day were performed in groups. Perhaps you can share food, shelter, felling axe and kettles? One of the most important and essential parts of you gear and skillset are those for making fire. The standard method used was “flint and steel”. Get a good fire steel in a pattern known to the originals from a vendor or blacksmith, and find a sharp piece of flint. Make some tinder and practice like crazy. This is a must! With water quality out in the wild being so unpredictable in most areas, a canteen to hold clean water is often a necessity not always shared by our role-models. Research to find out what type of canteen that suits your persona. Kidney shaped, drum shaped, tin, copper, wood etc. are a few of the options to pick from. Drinking from a fresh spring is a pleasure. Getting an upset stomach in camp is not. To save your buffalo robe we recommend that you always boil your water before drinking or use a filter-pump while on the trail or during fire bans. Only drink it if you are certain! A pure wool blanket is a very good way to start. As you progress you might want to compare inventories between historic and contemporary traders to find a match, not that easy! Trade blankets of different sorts such as the famous point blankets are still available. Some are factory made, others hand woven. Look into you own period of portrayal to see what colors and sizes was popular. As the cold sets in you might want to add more blankets or robes from animals from the area you portray. Wrap it all up in a tarp (discussed later) and you are good to go. Think hard before you buy a tent or readymade shelter. Do you really need one? If the answer is yes, take good time researching and talking to the dealers for exact material information so you don’t end up with a rubber sod cloth and nylon ties. Making your own is always an option. Canvas from hemp or flax-linen dominated but might be hard to find as a modern commercial option where cotton and a cotton-synthetic blend have become the standard. 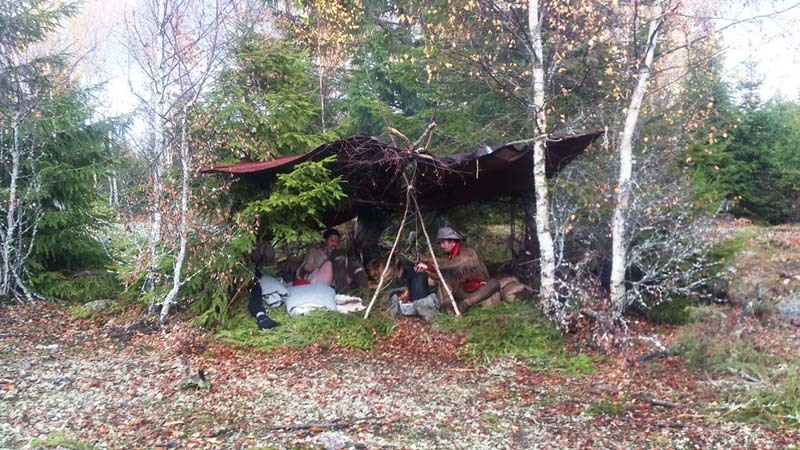 Hand stitched hemp and linen tarps and tents are available from a few makers in Europe. • Rifles, pistols, smoothbores etc. Scandinavian gun and hunting laws make us a bit restrained compared to our American friends when it comes to requiring, carrying and using historic weapons. Antique muzzleloaders made before 1890 don’t require a license in Sweden or Denmark and is a good place to start. But those easily available seldom have any connection to the American Fur Trade. If you can’t get hold of an antique weapon, or want a reproduction tied to the fur trade we suggest you buy a kit, finished or even custom-made weapon that fits your persona which will require a license. We recommend the weapon to be one of the last things you purchase as they are expensive and era-specific. Time and research are your best guides to what kind of weapon suits your needs. Flintlock ignition was the standard during the 1700’s and remained popular on the frontier way past 1840, with percussion showing up more and more frequently during the 1830’s. Revolvers were available in the east pre-1840 but so far no documentation has been found to support their use on the frontier that early. Whatever portrayal or era you choose; we recommend you to avoid all “fancy knives”. Cheap European manufactured so called trade knives in a variety of styles were widely available throughout the fur trade. Folding knives were also popular. 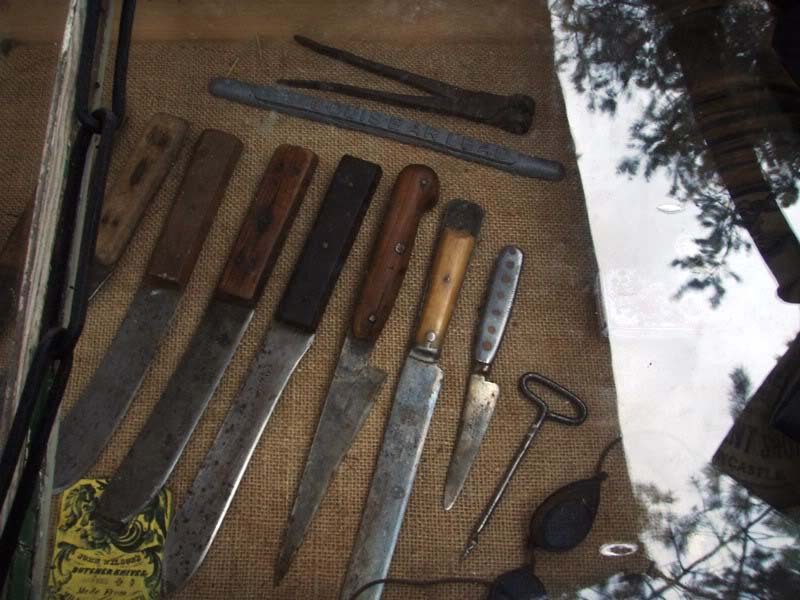 They were all usable tools for tasks such as skinning, butchering, sharpening sticks and cooking. Styles changed over time so do a bit of digging before you invest. Some are still being made in Sheffield, while others demand a skilled blacksmith to reproduce. Get one that suits your persona and put it to good use. Think twice before buying a Bowie or other fighting knife. A knife and axe combo does a better job. Used for everything from chopping wood to driving stakes into the ground. Produced in France, England or America, styles and sizes varied over time. 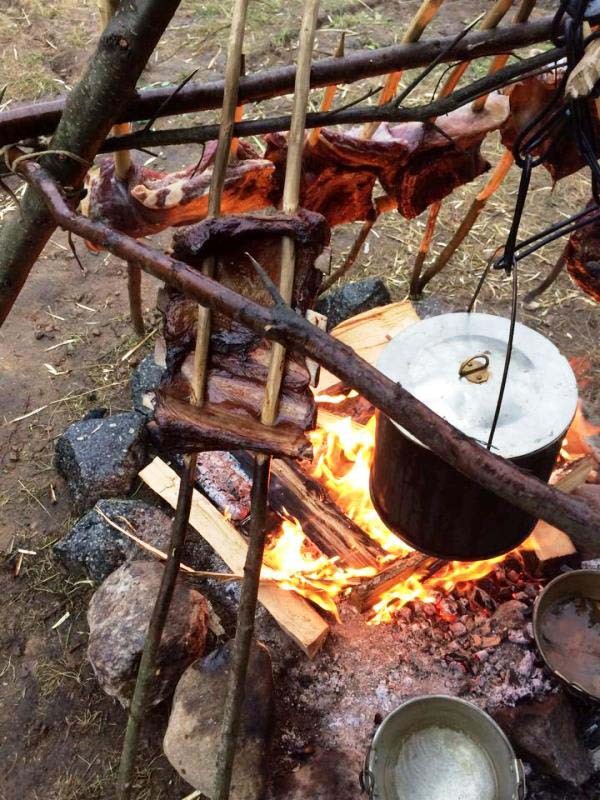 Throwing and smoking tomahawks so abundant on today’s market are not made for actual camp chores. Look at axes from your period and pick a style that can actually perform around camp, put on a straight handle and chop some wood! We usually bring belt size axes as personal gear for small chores and at least one heavy felling axe during the cold parts of the year for log fires. Bullet pouches and powder horns followed the use of muzzleloaders and were there to keep the weapon functional and loaded as their primary function. Styles varied with time and region. For the beginner a plain cow horn and a simple leather bullet pouch (shooting bag) sized for your shooting utensils and perhaps your fire kit is a good place to start. Add some research to adapt it to your persona. Thinking twice before bringing something you have to carry is always recommended. Think three times before you put something in your bullet pouch. You should be able to wear it as long as you aren’t tucked in your blankets. As you likely have to carry everything on your back unless you aren’t fortunate have a horse or water craft, this is a place where you can save a lot of weight! Sheet metal kettles made from copper, brass, iron or tin were popular all through the fur trade. Cast iron was around but is better suited for someone settled in a cabin than on the trail. Enamelware simply wasn’t around before 1840, use tinned goods instead. A tin cup and your knife is a great starting kit for eating. Throw in a tin kettle and perhaps a sheet iron frying pan and you are good to go! For group events we normally bring a large tin kettle for camp stews, melting snow and purifying water through boiling. Think real hard before you drag along furniture on the trail or to a rendezvous. 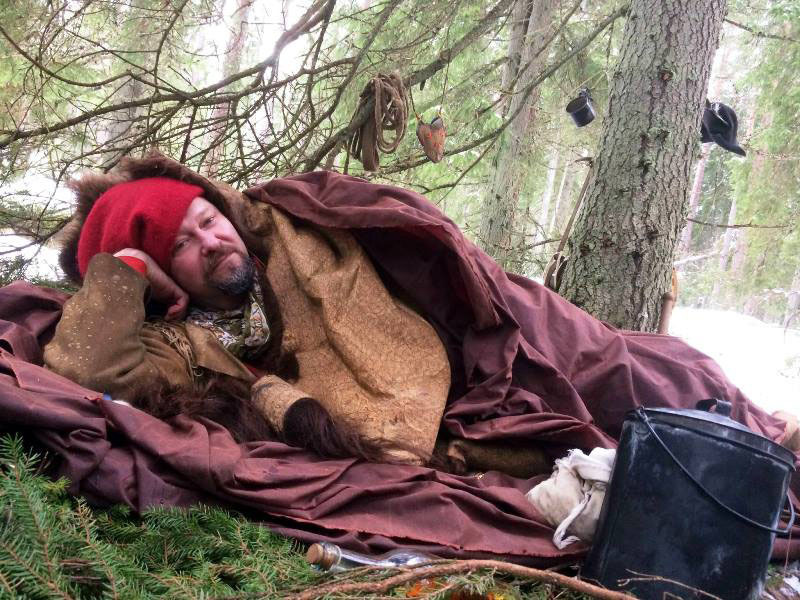 Would a voyageur or trapper really have bothered? Pick a good campsite instead that offers you the right ground to sleep, sit and eat. Use your blanket or trail partner to heat your bum on and lean up against a tree or a rock if available. As you start hanging around in camp you will soon hear the expression “kit” applied to various little tool sets. Fire kit, sewing kit, fishing kit etc. Although the historic accuracy of “kit” as a term can be debated, the functionality is of great importance once on the trail. As mentioned your first priority should be your fire-kit consisting of a fire-steel, flint and tinder. Depending on how you choose to travel there are multiple ways to pack and transport your gear. A “possibles bag” in the shape of a havresack or slit pouch is great for keeping your personal stuff in one place. Small bags for keeping everything from food to “kits” is another great way to stay organized. 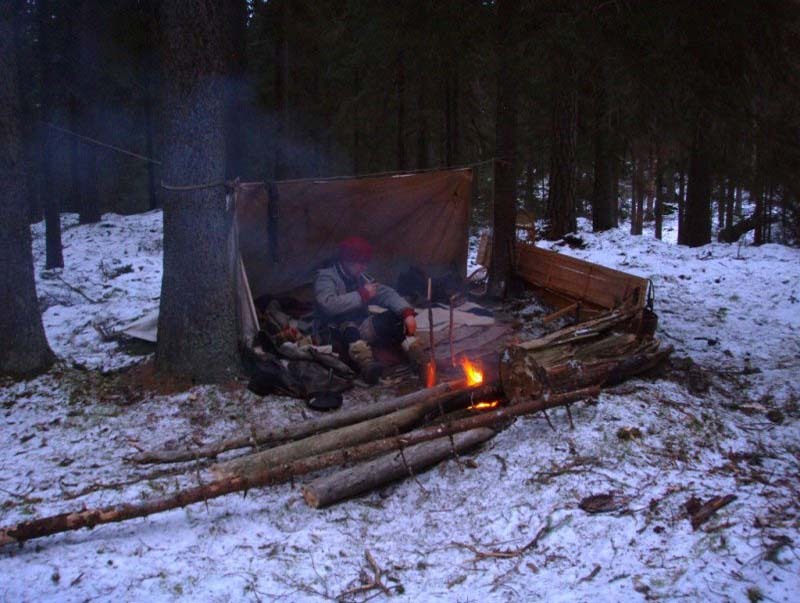 Bedding and other bulky parts of your gear can be rolled up in a so called bedroll or wrapped up like a bale with the main part of your gear in the center. Add a strap or two if you want to carry it on your back. Historic documentation and trial and error will hopefully make you find an authentic and somewhat comfortable way to get by. Don’t see these above guidelines as a task having to be solved before you start enjoying yourself. Get out with what you have or borrow from someone already involved and work yourself towards a basic authentic gear and skillset. Time will solve the rest. A part of the greatness is to see yourself and others develop. For further reading please scroll through our list of articles, links and our list of recommended reading found in the left hand menu.